Tt eSPORTS, the leading e-Sports brand in gaming products and event organizer, is announcing the latest keyboard creation KNUCKER. Collaborated and co-designed by Tt eSPORTS Team Tt Apollos pro-player Hermes, KNUCKER pro-gaming keyboard is unique in its unprecedented key-switch design. Installing Tt-Plunger switch technology, developed by Tt eSPORTS’ Key-switch Product Development workshop, KNUCKER is bringing the ultimate key response experience simulating to mechanical switch, but with extreme ease and comfort. The design concept came from Team Tt Apollos’ Hermes and his specific demands in easing the key-press strength during the competition. KNUCKER was co-created and went through phases of testing and evaluation by the members of Team Tt Apollos, and the KNUCKER demonstrated the obvious differences when Hermes delivered an All-Star performance in game Kart Rider since the beginning of 2012. KNUCKER pro-gaming keyboard is installed with the plunger-switch that simulates mechanical switch feedback, but with extra elasticity and comfort. The KNUCKER is also designed with the S4Key-Function to accelerate gamer’s need in rotating the command repeat rate in 4 modes: 1x, 2x, 4x, and 8x. This feature derives from the common gaming behavior also known as the Repeat-Rate Rotating Movement, or R3M in short. This behavior motivates the initial creation of KNUCKER, and to apply in gaming environment, the keyboard acts as a gaming solution to allow gamers such as Team Tt Apollos’ Hermes to switch the mode rapidly. Each key cap of KNUCKER is meticulously designed by Tt eSPORTS” Industial Painting Workshop crews to select the most durable yet visually vibrant Electric Cyan silk-print technique, applying on the KNUCKER and the silk-printed keys immediately attracts attention. 8 replaceable red caps are provided for gamers’ visual convenience, spotting the most-used keys: W, A, S, D, and the direction keys. Battle Dragon logo has been well-recognized as a representation of Tt eSPORTS by the e-Sports community. 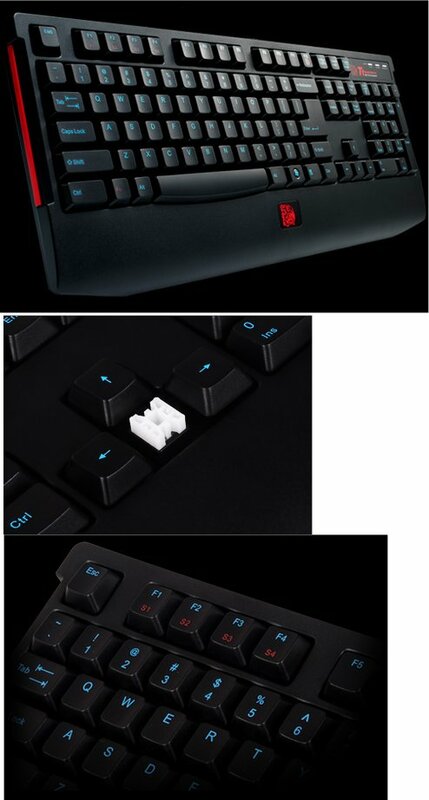 KNUCKER gaming keyboard designs F12 key as the Battle Dragon key, locating at the center of keyboard’s palm rest, seemingly floating between you and KNUCKER.